Painting your car is not an issue any more. 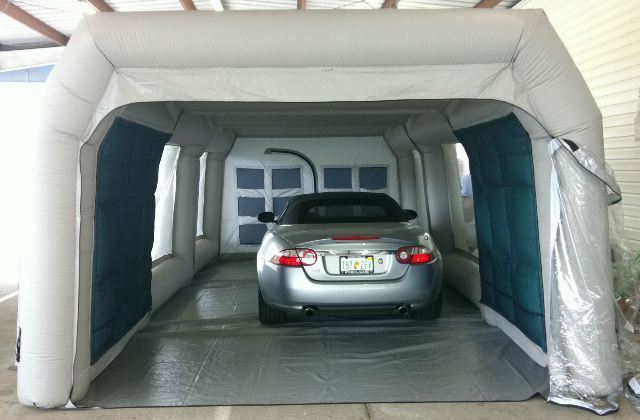 Inflatable spray booth will protect the surrounding area from pollution from painting. It consist of two parts only: the filter system and the inflatable part. The inflatable part is made from hight quality and strong PVC; tarpaulin. And the window is made from transparent PVC so you are not fully isolated from the outer world. It comes also with two blowers, one to give you fresh air and ventilation while working inside this plastic home and the other is to inflate the booth. The good news: this inflatable spray booth comes in different sizes and colors to serve all the needs. So you do not have to buy small one that your car will not fit in, or buy a too big one that will take the whole space in your garden. Now you can save money by painting your car and enjoy doing it your self as no body will understand your car needs as you.